The Fifth Judicial District Commission on Judicial Performance unanimously recommends that Judge Russell H. Granger BE RETAINED. 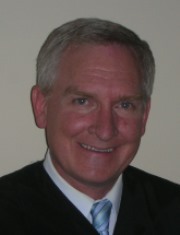 After attending Colorado Christian University and Western Bible College, Judge Granger went on to receive his law degree from the Southwestern University School of Law, Los Angeles, California in 1991. After law school until 1998, Judge Granger was in private practice in Georgetown, Colorado. He was also the Georgetown town attorney. In 1998, Judge Granger was appointed to the County Court Bench in Clear Creek County. In 2006, Judge Granger was appointed to the District Court bench sitting in Clear Creek, Eagle and Lake Counties. Currently Judge Granger sits in Eagle County where he has a docket composed of civil, criminal, domestic relations, and juvenile matters. Because of his recent move to Eagle County he currently is not involved in any community service activities but is searching for those opportunities. He previously volunteered as a member of his local fire department and was a member of the National Ski Patrol. The Commission reviewed written evaluations of Judge Granger from attorneys and non-attorneys, his written self-evaluation, a sampling of Judge Granger’s legal rulings, observed Judge Granger in the courtroom, and received input from the District Attorney, the Public Defender, law enforcement, and other general members of the public. One hundred three attorneys were surveyed regarding Judge Granger. Of those 103 attorneys, 80% recommended retaining Judge Granger, 3% made no recommendation and 18% recommended Judge Granger not be retained. Of the 173 non-attorneys who were surveyed 78% recommend retention, 11% had no recommendation, and 11% recommended that Judge Granger not be retained. (These percentages may not add up to 100% due to rounding.) Appellate Judges gave Judge Granger an average score of 2.8 compared to the 3.46 average score of all other district judges evaluated statewide during this retention cycle. Judge Granger’s overall score was 3.36 on a 4 point scale. The Commission was highly impressed with Judge Granger’s excellent legal abilities. Judge Granger’s legal rulings are intelligent, analytical, and well thought out. Judge Granger also excels in the management of his own docket. His orders are all timely and he is currently up to date in his workload. Judge Granger has also worked hard to improve his courtroom communication skills. He is perceived as evenly tempered and does a good job with allowing everyone in the court room to have an opportunity to speak and feel heard. Judge Granger values the concepts of “access to justice” and those principles are reflected in how he handles his courtroom. Judge Granger’s strong docket control has, however, led to a perception that he is inflexible and prosecution oriented. Judge Granger’s analytical personality also makes him less approachable than some other members of the judiciary. Judge Granger could benefit from self-reflection as to how he is perceived by litigants and attorneys alike, to address perceptions regarding his neutrality and to create a more approachable courtroom experience.